I’m confessing my fault to you here. My husband, Roger, and I are preparing to move from our Oklahoma home to Pittsburgh, PA. Since Roger is already at his new job there, all the moving preparation and sale of our home fell to me. Roger and I have been married for 43 years and until June 1, 2012 when Roger left for his new job we’d only been apart about twelve days our whole marriage not counting Roger’s daily treks to work. Stress mounted a mighty campaign against me. I fretted about having the energy and help to get everything done. I worried over the sale of the house. I allowed worry to creep in about finding a buyer, paying off the mortgage, and having funds to put down on a new home. All this knowing full well that whether we buy a home or rent, God will provide. Yet somehow it just all overwhelmed me at that time. Part of the problem was that I’d listened to, and taken too much to heart, the news on home sales and the downgrading of banks as analysts raged on about how that will cause lenders to tighten up on home loans and other lending and cause increased costs. This was on a highly respected news show and the news was not good by a long shot. At that moment I wasn’t heeding God’s Word. Shortly after watching that program, an email report arrived from a home evaluation site which said the value of our home had dropped 3%. What they based that on is a mystery to me. Other homes near us were on the market at the highest prices in a long time and had sold for more than the asking price in mid-May and June this year. I grabbed my stomach which was acting like it was on a roller coaster and started obsessing, “What will we do if we can’t . . . if this doesn’t happen we won’t . . . if our home doesn’t sell . . .” Nagging doubts circled my brain like vultures over a dead cow. I sat there in my living room, tears in my eyes, and whispered, “Jesus help me.” It was all I could muster right then. What do market forces have to do with you? Why are you allowing Satan to steal your joy? You are my off-spring, fruit of my loins, my children! Faith can move a mountain, so it can change market forces so all around you benefit. I told you that you will do the same things I did and even greater. What is a mere financial downturn? I spoke to the wind and waves and the storm calmed. You must speak to this financial storm raging all around you and let peace reign wherever the sole of your foot touches. The mention of my Name causes all of Hell to tremble. It will also cause the floods of financial ruin to part before your feet so you walk to your assignment from me on dry ground. Though flames of fear rise and scorch the hearts of millions, speak my name and go through the fire whole, coming out with not even the hairs of your head singed or the stench of the smoke on you. Do not heed the naysayers, those who dabble in doom to control your thoughts. Think on Me. Think on the things that are lovely, pure, of good report and expect them to come your way. The Lord is my helper; I will not fear. What can man’s intentions, his sinful ways, his rebellion against the Most High do to me when my life is hidden in God in Christ Jesus? He is providing for all my needs according to His riches in glory in Jesus and no man can separate me from His loving kindness and mercy, new every morning. I needed to share this with you, readers. Before we call God answers. We should take him at His Word because He is faithful to perform it. So, taking a deep breath and putting all our trust in the Lord Most High, Roger and I have chosen to believe our house is already sold – even before we list it for sale. What do you struggle with today? What fears, stresses, or doubts are circling your heart and mind trying to keep you from thinking on God’s promises, to keep you from holding tight to them? God’s Word is the highest truth. As His child you are an heir to his promises, ALL of them. Hold tight to that which is sure and steadfast. 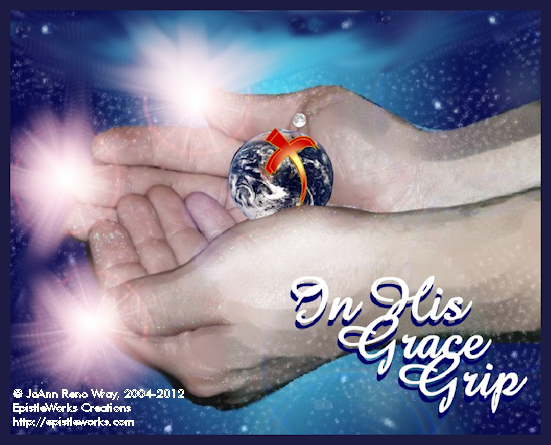 Let go of the world’s opinions and fickle ways and lay hold of God’s riches in glory in Christ Jesus. Those riches cover every aspect of life: spiritual, emotional, physical, and financial. God is blowing his breath and parting the waters. Be ready to walk on through! Be unto me a strong tower, O Lord. Circle my heart with your holy word like a fortress. Keep my mind stayed upon your promises and holding to you as my life preserver on stormy seas. Let me keep my eyes on your face and set my own like flint to deny the oppression of this world and follow hard after you. In Jesus’ name and by the power of His Cleansing Blood, Amen and so be it! To leave a comment, click on one of the comments at the right or click the small number at the top of the article and the comment box will show. Sign up to Receive Epistles from the Heart! But Mom Always Said. . .